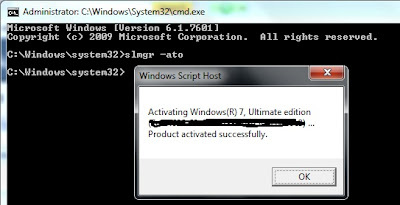 Windows 7 Build 7601 not genuine after installing Service Pack 1 FIX(Updated)) – user's Blog! This post was done 2 years back when i started blogging ! 1.If you know your windows is not an bought one then i recommend you to use this software called windows loader. to use it just run it– it takes some time to run on slow computers as it analyses your computer and accordingly loads the correct serial in it. This will do your work and you dont need to go more deep into the other steps. after i got this message saying that my windows is not genuine. In my case i already applied RemoveWat 2.2.6 before i installed SP1,but then after i installed SP1 on my PC it was a mess. If SP1 installed already,apply the whole steps. The validation and updates will still be available after you apply the steps. 1. 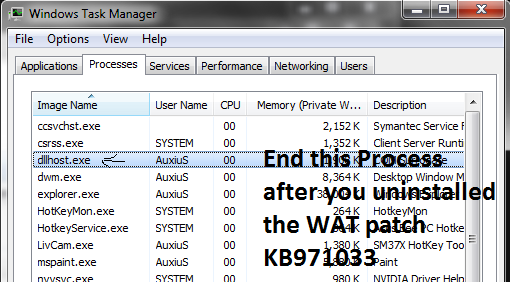 First we need to Uninstall Windows Activation Technologies (WAT KB971033) it has to be removed before we proceed. Go to Control Panel > Programs and Features and Click “View Installed Updates” on the upper left corner. Then right click to “Uninstall” the patch then press “Yes” as shown below. 3. After you reboot repeat step 1 to check whether the (KB971033) patch is properly removed. 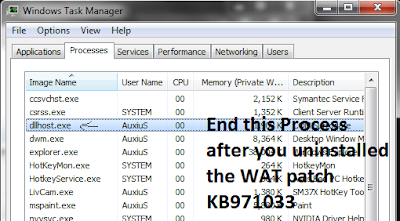 If patch appeared on the list proceed to step 1 except step 2[if not on the list proceed step 3a] and after you “Uninstall” Patch (KB971033) on the second time open “Task Manager” Click on the “Processes” Tab, find “dllhost.exe” then End this Process. Now go to system 32 folder and search for this file systemcpl.dll. Right click on it and there will be a option called take ownership click on it. 4. Right click-properties-security-click “Edit” button.And on every User names or Group below tick “Full Control” apply and delete the file.Paste the downloaded file systemcpl.dll here. 6. Click Start Button and type “cmd” then important to run “CMD” as administrator. On cmd type the following command “slmgr[space]-rearm” and a msgbox will appear says that you have to restart your pc press ok then restart. 7.After restart,run CMD as administrator type the following command “slmgr[space]-ato”,press OK.[if error occur ignore it]. 7. Click Start button type “Windows Update” and run,Click “Change Seetings” and set “Important Updates” to “Let me choose whether to download or Install them” press Ok,click “Check for Updates”.If windows finds an important update,click on it to verify. If patch (KB971033) is on the list, right click then “Hide Update”,else don’t hide if its not (KB971033). Your Done you have a fully activated windows 7 now!! Super piece of writing, I will be browsing back again regularly to find fresh news. Hello There. I found your blog the use of msn. That is a very well written article. I will make sure to bookmark it and come back to read more of your useful info. Thank you for the post. I will definitely comeback. I like this blog so much, bookmarked . Hello.This post was extremely remarkable, particularly because I was investigating for thoughts on this matter last Sunday. This really is some thing I need to find more information about, appreciate the post. Hmmm. Didn’t work for me. Followed all the instructions and everything seemed to work. A few hours later the Build 7601/Not Genuine notice shows up again. It goes away when I run MGAdiag, but I’d just as soon not have to do that. This is Ultimate 64 bit version. it seems that u haven't followed the instructions. it seems that your PC is downloading back the (KB971033). see to it that u do it as given. there are different downloads for both 64 bit and 32 bit windows please see to it and try again! it worked for me as well as other people so please try it out again takes only 30 mins. This usually happens when there is an interruption in the process !! So, everything works, I don’t get pop ups, the little 7601 is not in the corner, I was able to delete slui.exe.mui, and the security update (KB971033), as well as do more windows updates without that **1033 showing up. My only hang up right now is that Microsoft Security Essentials is telling me that my copy of Windows is not Genuine and does not pass Validation, and that I have 28 days to resolve… should I just uninstall and re-install MSI? correction *MSE, (Microsoft Security Essentials)? or if you need some other Antivirus full version please tell i give it to you !! i have made it to support people and help them. I started off with money making and later on learnt that what people want is not ads etc it is the content and downloads !! Well, I repeated the process and it seemed to take this time. As far as I can tell, I did the exact same thing over again only this time it worked. 🙂 S’all good. What version of windows are you using ?? thanks a lot ashish, at first I was doubtful whether it will work or not but your advice that to step by step is really very very helpful, thanks a lot again..
I’m having a hard time downloading the systemcpl.dll file for 32 bit os and slmgr files. Could you confirm the links? Thanks, second time using it in the last 2 months, odd thing is that file is still not in my computer and still doing the stupid thing and I have to type in the rearm again. Now go to system 32 folder and search for this file systemcpl.dll. Right click on it and there will be a option called take ownership click on it..
when right clicking there were no opt. for take ownership ,,,,wht should i do ??? i m attempting the wrong folder ,its ok now . thanks ashish !! now my not genuine text melt in the screen sever . thanks for your magistic idea .we did uninstalation,take ownership,fullcontrol, run,paste,edit remove ,but ashish! what’s the logic behind it ?? how it turn to genuine or to a gaming theorom or what ever else ??? howwwwwwwwwww ?????????? Well you see when you do not take ownership you cannot do anything/ Delete the Windows file as it is protected. Now when u take the ownership, you actually do over-ride the functions of the OS so that it gives you the full control to modify the file. got it ,we cheat brainless computer with our brain , what we code that much it understand ,we take advantage of this . we delete their marketing file and add our own one. .if u write that slmgr and systemcpl.dll code then really heads up mr. .
i thank full to ur knowledge and hard work…. can microsoft track me in some days ?? Hey I try to Delete Slui.exe.mui. But Your need Permission to perform This action Message was Come How to Delete Please Help Meeeeeeee Thanks. I applied the procedure before updating to sp1. It worked fine. The next day sp1 was downloaded and installed on my laptop. After that i started seeing the “windows is not genuine” message on the right bottom of the desktop. But when i checked the properties of my computer, everything looked fine. After that the message from the desktop just vanished. I applied the procedure again thinking that it is due to sp1. Now my computer is working fine but occasionally the message on the desktop keeps on appearing and disappearing. When ever it appears, i check the properties of my computer and os activation info area is blank as it was after applying your procedure. whenever the message appears, the desktop is preserved, i.e. it does not become black. I had done all the changes on 26th as suggested by your procedure and had removed the update KB971033 also. I had also made the update hidden in windows update.On 27th sp1 was installed. Now if i look at the installed updates in programs and features in control panel, KB971033 is not listed. But if i look at the update history in windows update, it shows that KB971033 was successfully installed on 27th. Please help…..
thanks it worked for me. Ashish, I have again tried to apply the procedure. The last time i did the procedure, i had replaced systemcpl with your file since i coudn’t delete it even after taking ownership. When i checked its properties, the create and modified dates were old. This time i deleted the file in safe mode and copied you file in its place. Lets see if this really helps. I have another doubt, is this method future proof? I mean if we keep the updates on and if microsoft releases another WAT update with a different name and if that gets installed on a system, will this method fail? Even after reapplying the procedure, sometimes the message flashes on my desktop for some time, the desktop remains preserved.i.e. it doesn’t go blank and the system continues to work normally. This usually happens after i resume from a running screensaver. Everytime the message appears, i check the system properties and it appears to be working fine i.e. there is no activation info available. Just after checking the system properties the message vanishes. Right click on properties then go to the Security folder then click on Advanced. Click the owner tab and then switch the owner to yourself. Click apply then go back to permissions and give you self fullcontrol over the file then hit apply. Now you should be able to delete the file. hey the link in step 5.
is missing. can you repost? Link at Step 5 is dead, can you please upload it and give a new link? I am trying I am trying !!! My account is suspended and now i am litrelly hunting for the file !!! i did this 2 3 months back successfully. But i hav no idea y this watermark came up again(10-15 days ago). Today(22.8.12) i followed the same procedure again and encountered many issues like- slmgr link was dead, ownership and all didnt went as it was supposed to be. After running cmd and restarting for the first time, the watermark got removed.now HOPING that i do not need to do it again in future..
this is for 32 bit opration or 64? may i get a new link to the step 5, please? When do you estimate it will be ready by? hey ashish i hav all the steps as mentioned untill 4 but the link in step 5 is not working so plz giv a new link soon…. Ashish, any word on that missing step 5 slmgr file? I have been waiting to complete the steps…thankyou! Instead of naming the file slmgr or something like that, name it My Cookie recipe, Works 90% of the time and avoids detection. Tried your method 😀 Named it Cookie !! Its Is NOW !!! DOWNLOAD IT FAST !!! Used this method awhile back and worked like a charm, but recently Microsoft Security Essentials will not install or update, stating Win7 did not pass validation. KB971033 is not installed. Any ideas? We all need to stop downloading sp1, its crap, change your updates to important update only, download everything until sp1…………don't do it, install the loader listed here and your don't………change permissions in windows 7 to remove trusted installler as boss and set urself as boss, delete slui.exe.mui. them slui.exe (install a text slui.exe.txt first) screw this microsoft spy crap. Hey Ashish.. the download link for the registry tweaker isn’t working. Thanks for your help! help me plz. in step 6 On cmd type the following command “slmgr[space]-rearm” when enter is appear windows script host it say on a computer running Microsoft non-core edition,run ‘slui.exe 0x2a0x8007007E’ to display the error text. hi ashish, i have the same problem, but i have deleted slui.exe already, and i cannot find it anywhere anymore. pls help. Hey Ashish Please tell me What is the dllhost.exe *32 when open Task Manager. U must close the file that is running if you want to make some changes to it. This is the only method that has worked for me. thanks, man, seems to have worked a charm! dude! what is slmgr? I have tried more than thirty times but it is not downloading? The registry tweaker link doesn´t work. THIS ROCKS DUDE! FINALY SOMEONE THAT COULD REALLY HELP ME! Will not except slmgr on cmd. It tells me it is not recognised and that it is a bad batch or program. How do i get past this? can i use daz windows loader after this? No need to cause it will activate it for you man !! when i used to click the window downloader link it installs and it works ….without doing any further steps…so tnx man!!!!!!!!!! Y did u do that ?? If you meant why did I delete the WAT was because it wouldnt let me install any drivers or updates and figured i should uninstall the WAT manually which worked and could install updates and drivers…should i re-install the WAT…also i can get the original disks that were used to update this computer from xp to windows 7…I have tried just inputing the original key but windows wont accept it. what is my best bet, im thinking to use the disks again and install a fresh copy of windows 7 on this computer and not accept the WAT update hoping this will solve the problem…As of now i can update drivers and so on but am worried to turn off the laptop. So again whats my best bet, either use the disks again and not accept the WAT, re update the WAT and use the method mentioned above, or do not update WAT and use method above. Whats weird is that my friend used the disks on his computer which came with the disks and he has WAT on his but the same key wont work on mine so im confused. Any help is appreciated…Thank you for your help. 2. Only remove WAT link is gone. Once again just wanted to let ya know that this disk was included with my friends laptop and his brother used it on this laptop i am using…he has the WAT file installed and active on his laptop with no problems, hopefully reinstalling the windows 7 will fix all files relating to WAT. I think im going to run remove WAT file 2.2.? file before using disk. Thanks for your help and responding to my questions…much appreciated. I tried using the disk but it is assigned to only one computer so I’m left having to do it as stated above…I cannot find a real removeWAT program…All i have found want me to download NCloader and other useless programs in order to get it and finally i found one but when executed it does nothing…Is there a good link you have in order to finally get the removeWAT program and functionally use it please please…I then will attempt the steps mentioned above. Again thank you for your help and advice. Also as mentioned before I manually took the WAT update off my computer…Other than the annoying black screen, the message in the lower right corner and the occasional reminder that my windows may be not real the laptop seems to be working fine…it installs windows updates other than the blocked WAT, it installs drivers for other devices which it didn’t before when WAT was installed…If you could maybe email a copy of removeWAT, a real one, that would be much appreciated. Thanks again for help it is much appreciated. Well, my problem is that my Windows Ultimate SP1 64 bits don’t recognize the command slmgr. My version is in spanish. you know why i have this problem? Although, I seem to cannot run programmes as administrator any more, only take ownership, any thoughts? I am at step 5 in the updated procedure. I have clicked on slmgr and something is taking for ever to download. Its some sort of video player or codec pack or whatever. It also shows a box that says click here, and one that says youre almost done. Am I on the right track? My downloads are usually fast so this is weird. Any suggestions? In step 7 can’t find the system32en-US folder while looking for slui.exe.mui. However in system32 there is a file called sluie.exe . I tried to delete that but it says I need permission from trusted installer to do this. What now? Apart from the problems mentioned above I completed the procedure, KB9711033 was removed and did not come back. However I still have the bottom right hand corner message, plus extra messages from MS, plus some junk that downloaded when I clicked on slmgr. Whither? I just ran the windows loader per step 1 on page 1 of the Updated fix for 7601. It took about 30 seconds and seems to have fixed everything. I should have done this before I started the 7 step approach. Thanks for the great help. hi it worked for me …. thanx. Can i install further updates without having any problem???? Then my PC startet “Windows is not Genuine” and i not could find a loader…. But i think its ok for you to not update and all !!! for anyone having problems still with the KB971033 patch thats injected during the SP1 update. I did this which worked and im still activated (x64 Ultimate with activation hack) after the SP1 update. 1. let the SP1 update down load and pre -install (the rest happpens on reboot). click on the installed updates link and scroll through the updates list to find the KB971033 patch, untick it and right mouse button on it choosing uninstall. 4. when the uninstall of the patch has finished then continue onto the windows restart. if it works as mine did windows will process the SP1 update without including the KB971033 patch. windows will reboot after a time and you will have SP1 installed and activation intact. it works, thank you my good friend! Is your Windows Activated ? The link for Run RemoveWat 2.2.6 says the file has been deleted. Do you have another link or can you replace the file so I can give this a try? blogosphere. Short but very precise info… Many thanks for sharing this one. Trouble after Installing IE 11 on Windows 7 after using this trick! Please Help. After Re-enabling dwm.exe and restarting dwm service, it again stops & and I’m not able to figure out the problem. Thanks Ashish. It works very well. Only one query: After installing and restarting, antivirus indicated potential threat for 2 dll files in Win32 folder and recommended to remove them. Shall these files be allowed as exception or removed? Accidentally I have permitted antivirus to remove the threats and still Windows is working well. Do I need to repeat your recommended whole process again? The message is gone, but I still have the black screen. How can I get blue screen back? Ashish, please help with HappyCookies file. Nothing happens when I click Download or Direct Download buttons. Thanx! Thanks followed the first method of windows loader and it worked perfectly without any hassles.Even both important and optional updates are available for download as during the trial period.Thanks a lot bro.Bookmarked this page. Ill see what i can do ..
any chance anyone can get me the slmgr? Hi Ashish, I am Akash singh. I was getting the problem Window is not genuine So I take heip of internet Now It show 27 day to activate the pack of Window 7 Enterprise Sp1 on my Pc . I saw your process step but I could not download any file like windows loader etc. from your given link. Please help me !